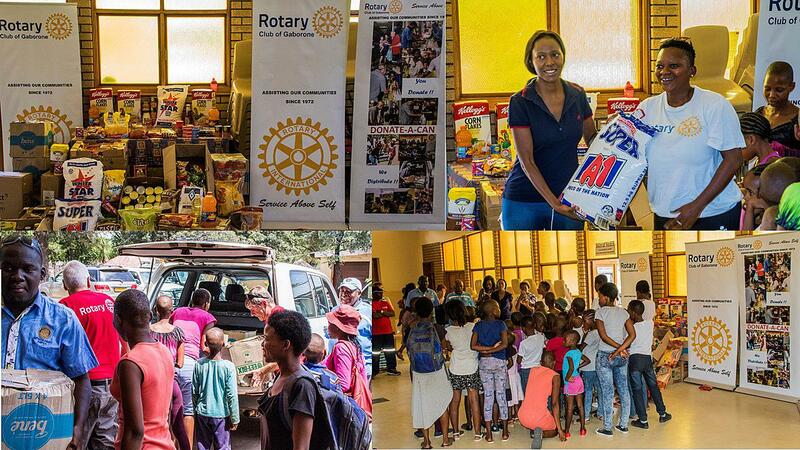 On the morning of Sunday, 21st January, 8 Rotarians went to Lesang Bana in Metsimotlhabe to do the 4th and last distribution of some of the proceeds from the "Donate a Can" project. The team consisted of Past President Barbara Butchart, Past President John Cunliffe, and Rotarians Graham Burt, Alan Golding, Ian Paddick, Mpho (Brandy) Mbangiwa, Roy Davies, Casmir Jongman. The team arrived at Lesang Bana just before 11:00 and we were met by Sister Paulina . Sister Pauline advised that they did not have a safe place on the complex to store the food as they had experienced a lot of theft and so they wished to store the food at St Josephs on the other side of Gaborone. 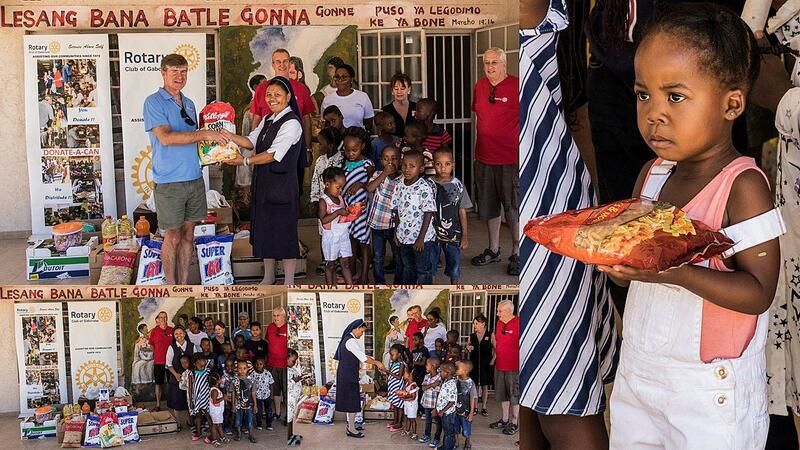 Some of foodstuff was offloaded and presented to Sister Pauline who accepted it on behalf of Lesang Bana. 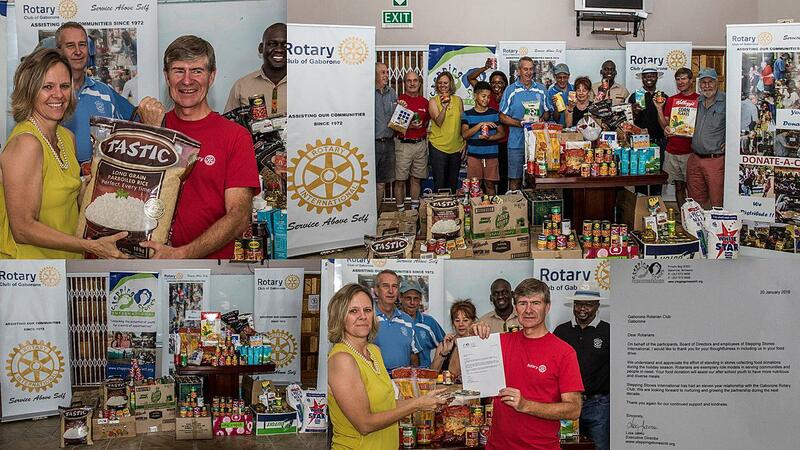 Photographs were taken of the handover and then the foodstuff was loaded up again and Rotarians Roy and Alan took it to St. Josephs. Before leaving Past President John gave Sister Pauline a tub of sweets that was left over from the Carols by Candlelight evening which Sister Pauline distributed to the children who were present. 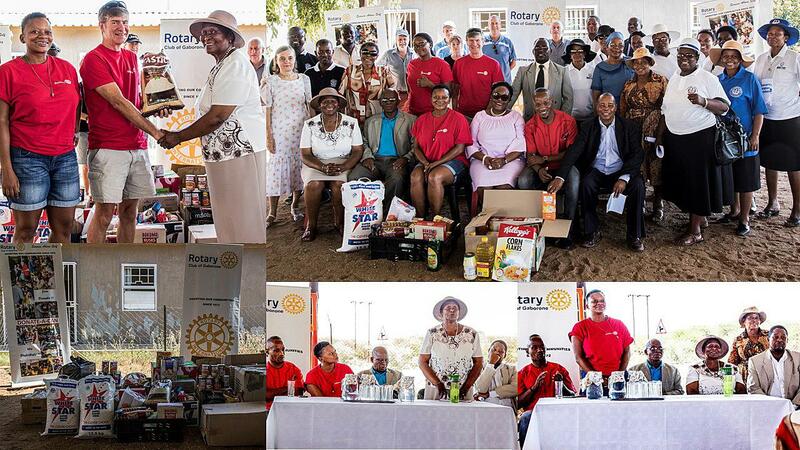 In the afternoon of Saturday, 20 January, 16 Rotarians went to the Botswana Retired Nurses Society Centre in Tlokweng to do the 3rd distribution of some of the proceeds from the "Donate a Can" project. The team consisted of President Tebogo George, Past President Barbara Butchart, Past President John Cunliffe, Past President Rose Selema , Past President Antony Chigaazira and Rotarians Graham Burt, Jon Major, Johannes Mokwena, Alan Golding, Ian Paddick, Mpho (Brandy) Mbangiwa, Roy Davies, George Stirling, Casmir Jongman. We were joined by Past President Erwin Happel from the Rotary Club of Lobatse. We arrived at approximately 14:30 and were met by the Centre's Director, Mrs Kewakae. The foodstuff was offloaded and presented to Mrs Kewakae who accepted it on behalf of the Society. 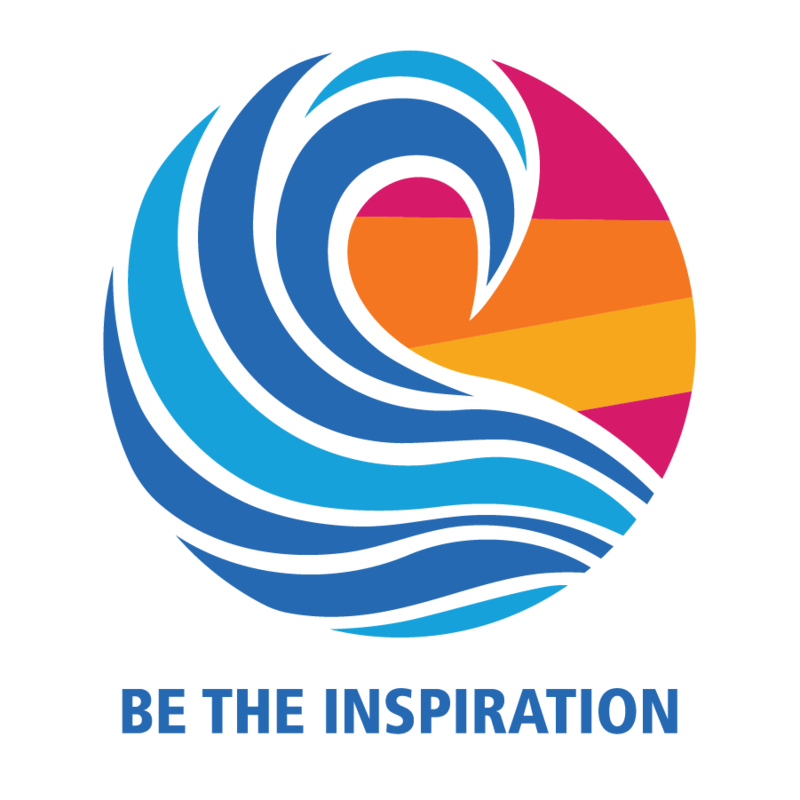 On the morning of Saturday, 20 January, 11 Rotarians went to Stepping Stones International in Mochudi to do the 2nd distribution of some of the proceeds from the "Donate a Can" project. The team consisted of Past President Barbara Butchart, Past President John Cunliffe, Past President Antony Chigaazira and Rotarians Graham Burt, Jon Major, Johannes Mokwena, Alan Golding, Ian Paddick, Mpho (Brandy) Mbangiwa, Roy Davies, George Stirling. The team arrived at Stepping Stones at approximately 09:30 and we met by the Exectutive Director, Lisa Jamu. Lisa gave those Rotarians who had not been Stepping Stones before a tour of the facilities. The foodstuff was offloaded and presented to Lisa who accepted it on behalf of Stepping Stones. Lisa then presented team leader Ian Paddick with a thank you letter addressed to the Rotary Club of Gaborone. On Saturday 13 January, we started the distribution of the proceeds of the “Donate a Can” collections. President Tebogo George and 11 Rotarians being Immediate Past President Ignatius Ndzinge, Past President Barbara Butchart, Past President John Cunliffe, President Elect Keletso George and Rotarians Graham Burt, Jon Major, Johannes Mokwena, Caz Jongman, Alan Golding, Ian Paddick, Mpho (Brandy) Mbangiwa. They were accompanied by Rotarian Carol Bateman from the Rotary Club of Wasaga Beach, Ontario, Canada and Nicky Milner who is a senior lecturer at Angelia Ruskin University, East Angelia, United Kingdom. The team arrived at The Catholic Church hall a little after 10:30 am. The foodstuff was offloaded and presented to the Catholic Church community and some biscuits were handed out to the children that were in attendance. The Catholic Church community support the street children in the town and the destitute families in the area. They provide them with meals and bathing facilities and they also give food to the destitute families in surrounding villages.